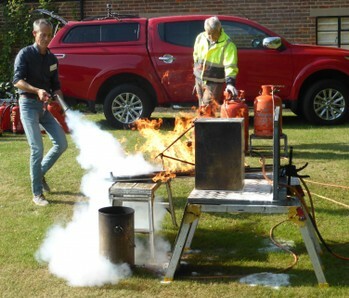 The Fire Marshal/Warden course is the most detailed and comprehensive training for staff and is designed to enable persons that have a specific fire safety designated responsibility to meet the requirements of the Regulatory Reform (Fire Safety) Order 2005. All companies or organisations must have in place arrangements for dealing with imminent danger and train persons to implement the arrangements. This course will prepare your designated staff to primarily understand the hazards and associated risk that fire may present in their workplace, they will learn how to mitigate the risk of fire and how to cope in an effective and more importantly safe way with an outbreak of fire at work. Fire Safety Management systems and effective evacuation procedures are essential elements of this course. A practical first aid firefighting equipment training session is provided as standard using eco-friendly gas fired fire simulators. Your understanding of the role of the Fire Marshal/Warden in relation to workplace fire safety and emergency procedures. An understanding of the main causes of fire and the means of reducing the risk. Knowledge of the principles of combustion and fire spread in a building. The ability to decide on what actions to take on being faced with a fire emergency. An understanding of human behaviour in relation to a fire situation. A good understanding of the effective use and practical limitations of workplace firefighting equipment. The ability to undertake routine fire safety management checks to assist your company to comply with legislation. Why we need to train. Causes of fire and fire development. Fire Fighting Equipment, theory and practical. The Role of the Fire Marshal/ Warden. The Role of the Fire Incident Manager. Course duration and content may be varied as required. Managers and/or staff with a fire safety responsibility in industry, commerce or the public sector. A Fire Warden Certificate will be awarded on completion of the course. Practical fire extinguisher training session.